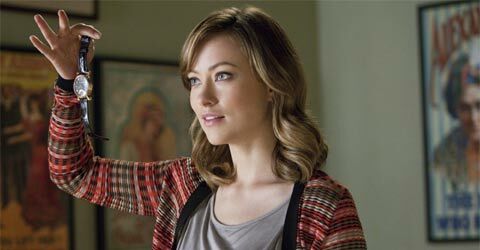 In the upcoming The Incredible Burt Wonderstone, Olivia Wilde doesn’t play your typical magician’s assistant. Rather than just being there to help out with the illusions and look pretty, her character, Jane, actually has big aspirations to be a magician herself, looking up to Burt (Steve Carell) and Anton (Steve Buscemi) as idols. But that’s not all I found out Wilde’s latest role on the set of the new comedy. Earlier this week I wrote about my time with a small group of other journalists on the Burt Wonderstone set, and during the course of the day we not only had the chance to watch Wilde act in a scene from the film, but also talk with her role between set ups. Check out the full conversation below, in which the actress talks about Jane’s bigger aspirations, what it’s been like working with comedic greats like Carell and Jim Carrey, and her own personal history with the world of magic. So no outrageous costume for you today? Oh, no, not today. Actually, yes today. In this scene I’m changing into an outrageous costume – so we see the transformation happen, which is kind of fun. But the good thing about this is that we all wear outrageous costumes and we all wear wigs. Usually that’s left to the women, but this one men get to share the burden, which is great. Did you grow up with any love of magic yourself? Yeah, I did. In fact all my birthday parties had a magician. I loved it. I had the magic set – which I just got the latest version – and it hasn’t changed since we all were kids. It’s the balls, the cup, the string, the knot trick…it’s all the same, which leads me to believe that enthusiasm for the simplicity of magic and the wonderment still exists as much as it did even - with the internet and all these new distractions. I think magic still amazes people and they like to be delighted by it. I think the enthusiasm for it is something people of all different ages can appreciate, which is why I think this movie will work – and because it’s hilarious. I mean I can’t believe a movie hasn’t been made – a comedy, I should say, hasn’t been made – about Vegas magicians. I thought the concept was really out there, but then we went to Vegas and we realized this is really a documentary. Which is great! I read the script a while ago and really loved it. I did go after it – I was really interested. Not only because of the cast, which is obviously extraordinary, and contains many of my idols, and not only because Don Scardino was involved – I’m a huge 30 Rock fan. I just think he’s a master of tone. I thought it was a great role for me. It was something I hadn’t done before. There was a certain challenge to it for me as well. I went after it, I auditioned, I was up against some real heavy hitters and I was totally shocked when I got the role, because it’s a comedic role and I was going up against some real comedians. I sort of thought I didn’t have a chance in hell, but it was so fun to just audition for it I just thought I’d go for it and take a chance. Then to get to read with Steve Carell was really amazing. One of the best auditioning experiences I’ve ever had. What is it like improving with Steve Carell? I think the reason it’s really fun to improv with Steve is that he’s not playing a game of solitaire. He’s very giving, he’s very generous. He’s kind of lobbing you the ball. I think he’s a comedic genius who is really creating a fair playing field so that you have the chance to hit the ball back and have fun with it. It’s not like he’s trying to challenge you or dodge you, he’s actually trying to rally. I’m using all these tennis metaphors! I don’t play tennis! [ laughs] I don’t know why it’s in my head. I should be using football after last night. [NOTE: Set visit was the day after the Super Bowl]. I just think that he makes it fun and all you have to do is listen and react and never deny and say, “Yes, and…” You just go back to your basic training in improv. With someone that good they just make it interesting for you, and fun. I felt that with all these actors. We just have a lot of fun together. Everyone is just so game and they’re all so smart and sharp. They have set you up for something really fun and great for every scene. I hope I’m not being too vague, but I think it’s been really interesting for me to learn from all the different types of comedians in this movie. Steve Carell is so different than someone like Jim Carrey. To get the experience of improving with both of them has been really tremendous for me. I’m just floored every day. I just can’t believe I’m here. You come into their group late – do you sort of comedically have to not fit in? What would you say is the defining characteristic of your character? She’s very smart, and she’s confident, and yet she’s a secret magician. She doesn’t reveal that she’s a magician in her own right until very late in the game. I’m not sure. She’s quietly brilliant [laughs]. On her best days. She’s a little bit crippled by insecurity. What is her connection like with Jim Carrey? I know that you end up leaving Steve Carell’s character for him. Yes, but not by her choice. In the end the work of many magician’s assistants is that it’s a job like any other. She needs it to survive. She needs a gig and she wants so work in the world of magic. So she is forced to find herself working for this very unsettling type of magician who has a very different style than she does. She’s put into some really odd situations with him and she kind of sadly goes along with it. I mean, out of necessity. But she is kind of unhappy to do so. Like wearing that red suit. How was that tight luchador costume? It’s so funny. We were at Universal City Walk and I didn’t think that anybody was going to take a picture. We had it locked down pretty well and then I saw the photo and was like, “Wow.” Then I thought, “They’re not going to know it’s me.” Then they sort of did know it was me. It was a costume that I didn’t want to get out until the movie, because it does have to be seen in context. Although hey, if it makes people curious that’s good too. It’s pretty funny, that costume. It’s an example of the position that Steve Grey, which is Jim Carrey’s character, puts me in. And how Jane, my character, really learns she has to go on a journey and stick up for herself – and finally gets to the point where she gets to design her own costume. That’s a great moment for her. What’s it like working with Jim Carrey? What’s your personal connection to him been like? He’s wonderful! It’s sort of surreal to be eating lunch next to Jim Carrey at [craft services] and then go shoot a scene with him. He’s a comedy god – all of these guys are. But really, Jim Carrey I grew up watching closely. Ace Ventura blew my mind. Fire Marshall Bill was a huge part of my childhood! To be with him and witness the process is such an extraordinary thing. I mean, he is a perfectionist. He is so incredibly physical, and in control of his physical comedy. It’s like watching a dancer. It’s amazing. He’s always at 100%. He has incredibly high standards for himself and it’s wonderful to watch him reach them. He’s a real interesting person too. We both share a passion for Haiti. He’s done a lot of great, interesting work down there. It’s amazing. I remember I sat down at the table read, and I suddenly realized that to my left was Jim Carrey and to my right was Steve Carell. Then there’s Steve Buscemi, Alan Arkin, James Gandolfini… I was thinking, “They must mean a different Olivia Wilde” [laughs]. I couldn’t believe it was happening and I took a picture secretly of our names on our little cards. I just couldn’t believe that I got to hang out with them. I’ve really learned something every day and taken advantage of that opportunity. Specifically with Jim, it does blow my mind of think of all the movies that are important to me. I think I’ve seen Dumb and Dumber 47 times at least. Now to be able to watch what it takes to reach those heights with all these people… Comedy is fun to make, but it’s taken as seriously as drama. Of course, you know all this, talking to people much more experienced than I am. I’m learning that in a really wonderful way and I’m hoping that this isn’t the last time that I get to do that.